There is a dramatic new trend in the global business world. Companies that were doing CSR projects to enhance image are now embedding sustainability and fair trade practices into corporate strategy to differentiate and succeed. 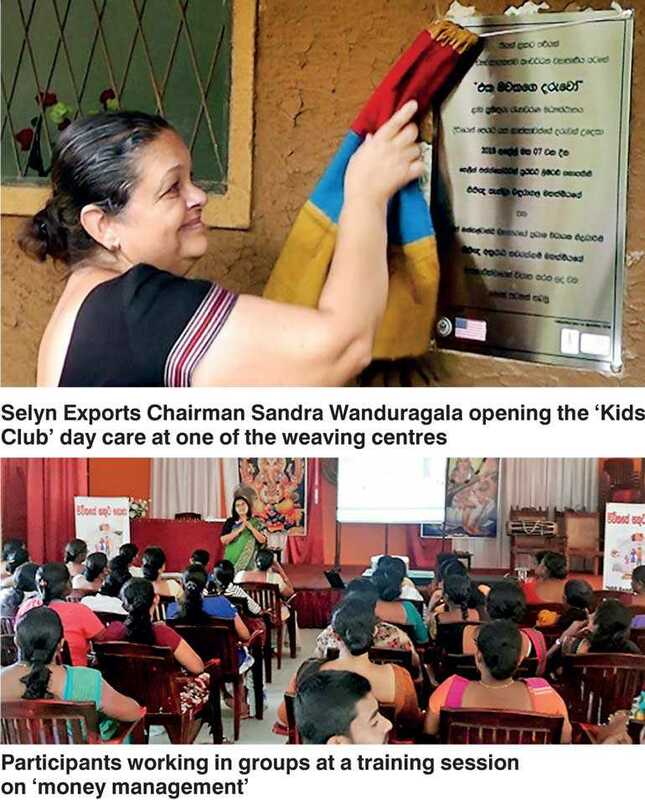 ‘Selyn Handlooms’ and ‘LIFE’ are two unique organisations that seek to empower communities in Sri Lanka and make a paradigm change and work toward incorporating sustainability for the benefit of both the business and the nation. As a pioneering endeavour, LIFE and Selyn Handlooms partnered on a community project named the “100 Hands Initiative” launched in 2016, to introduce sustainability initiatives. “100 Hands Initiative” is the brainchild of Selyna Peiris, the Business Development Director of Selyn Handlooms and Anuradhi Navaratnam, LIFE’s Founding Partner where a casual conversation turned into a committed effort at launching a project to support Selyn’s ongoing practice of empowering rural women by providing employment with a holistic approach. Selyna and Anuradhi, both alumni of US State Department’s International Visitor Leadership Programme (IVLP) submitted the 100 Hands initiative as a proposal to obtain sponsorship from the ‘Alumni Engagement Innovation Fund’ in 2016and was one of the projects that were selected from over 800 global submissions. The initiative recognised the dire need of economically marginalised women who seek employment overseas as unskilled labour which appears as the only available option. However some of the less fortunate women who go abroad in search of greener pastures return disillusioned, often having been subjected to abuse and exploitation. The project focused its activities in the Kurunegala District which has one of the highest numbers of female migrant workers. “Many of these women seek work overseas in order to feed their families, educate their children and to compensate for alcoholic husbands that do not provide adequately to maintain the family,” explained Anuradhi. ‘100 Hands’ paved the way for women to receive training in skills such as handloom weaving and sewing that lead to employment at Selyn Handlooms the only fair trade guaranteed handloom company which already offers employment and nurtures 1,000 women. Creating livelihood opportunities for selected women together with training on entrepreneurship skills, financial management, life skills and the health and well-being of their families ensured that their overall lives significantly improved. 100 Hands focused not only on giving them employment but empowered them with the necessary life skills, equipping them to realise their full potential. The project also partnered with Sanasa Development Bank to offer financial management training and banking assistance to the women in the 100 Hands program. Selyn engages traditional Sri Lankan community handloom weavers bringing you products handmade with 100% cotton and infinite measures of skill and devotion. Selyn believes that giving employment alone is not enough. “If you really want to empower and provide rural women with employment opportunities, flexible working hours should be provided considering their family commitments and with other social and technical skills to build their motivation and positive attitude. It has to be a system where while guaranteeing them constant work, programmes are implemented to provide women with access to child-care and day-care centres, legal advice, awareness programs on sexual health, self defence to face domestic violence, training on financial management and voluntary savings schemes. That’s what we do,” said Selyna. Furthermore, general health camps are conducted for the women, their families and also the larger communities they live in. To enable women to come to work, there is flexi-time for home-workers and bicycles provided to some women so they can cycle to work. An empowered woman is an empowered household and Selyn seeks to provide the platform for them to be that change maker in their homes and communities. “Handloom is just one of the industries that can help our rural women to stay at home and prosper without necessarily seeking employment overseas leaving their families and often face negative impact in the end. When these women are given opportunities they really excel and rapidly come up in life,” said Anuradhi, a lawyer by profession whose years of experience working with victims of human trafficking motivated her to launch LIFE. LIFE was founded with the vision of supporting vulnerable groups within communities to gain knowledge and skills, build entrepreneurship and provide economic opportunities and create linkages with necessary organisations and government bodies to empower not only the individual but also their families. “We would be happy to assist any business that require our know-how, skills and experience and help more and more enterprises to empower our rural women and vulnerable communities,” she added.